Past News Articles 2010- new brand for Sanrio? Has Ageism hit Hello Kitty? After 36 years Hello Kitty might be taking a step back from the Sanrio lime light….surely not I here you say! The creator of Hello Kitty Yuko Shimizu, has designed a new cat with very simpler features. 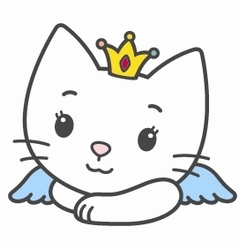 The cat called Angel Cat Sugar looks very similar to Hello Kitty and also reminds me of Charmmy Kitty which was a kitten designed as Hello Kitty’s pet a few years ago. Angel Cat Sugar has been very popular in Japan and America, and is seen as the new generation Feline for Sanrio. so trusted and loved by so many in Japan. This entry was posted in Hello Kitty, In the News, Sanrio and tagged angel cat sugar, charmmy kitty, hello kitty, sales, sanrio. Bookmark the permalink.